Our clients enjoy fast, friendly, professional service. They love dealing with a local, capable vendor. No matter the complexity of your printing job or how fast you need it, Colorprint will produce beautiful work and deliver it on time. Whether your print project is large or small, our knowledgeable and experienced people work closely with you to achieve your goals within budget. We’ll offer advice on how to plan your project to keep costs as low as possible. There are times when changing the size of your piece by a ¼”: can GREATLY lower your invoice. 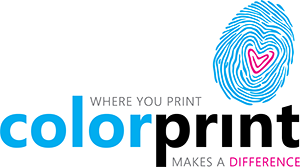 You’ll receive excellent printing services that deliver on results. Best pricing requires matching the job to the right press. Our equipment includes 1-, 2-, and 4-color offset and digital presses so we can ensure your job is printed with maximum efficiency and speed. We are here when you need us most—even for projects with same-day turnaround. Our team will work overtime to make sure your printing job is completed on time. Contact us to discuss your project or complete the online form today for a quote.